For 17 centuries, the Greek Orthodox Christian monks at the Sacred and Imperial Monastery of the God-Trodden Mount of Sinai (St. Catherine’s for short) have protected a treasure trove of ancient manuscripts, second only in significance to the Vatican’s huge collection in Rome. 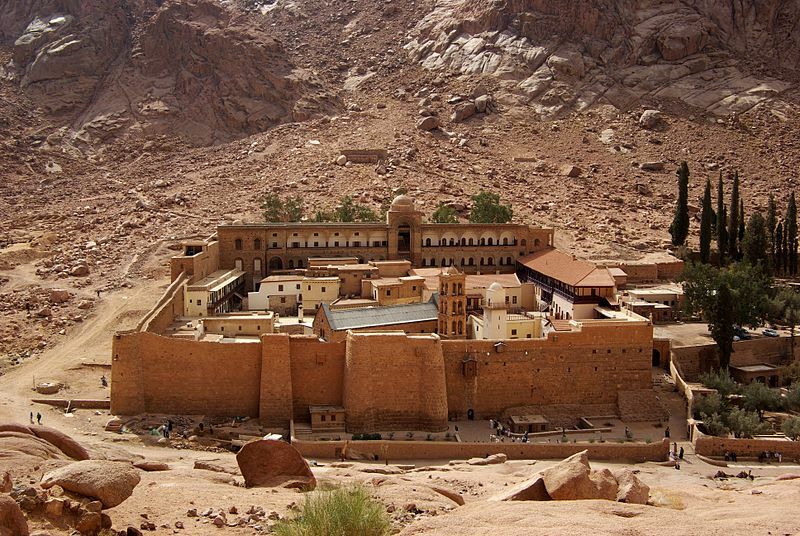 The monastery is located in the middle of the Sinai Desert and is a United Nations-designated World Heritage Site. Most of the library’s texts at the monastery are religious, but other writings are also represented, such as a 9th century copy of Homer’s “Iliad,” complete with grammar and vocabulary notes. Of great importance, is the monastery's collection of palimpsests. These are erased texts, which lie obscured beneath more 'contemporary' text (this is relative in such an ancient place). Text such as these came about because animal-skin was an expensive commodity and was often 'recycled' by scraping off previous text. The monastery holds at least 130 palimpsests, all from medieval times. One of the richest sources of palimpsests has been a collection known as the 'New Finds'. The monastery is now engaged in a multimillion-dollar project to physically and digitally protect its precious holdings and make them easily accessible to scholars around the world. The palimpsest spectral imaging system uses three basic strategies to reveal the hidden text. LEDs bathe manuscripts in light of a specific color or wavelength range, from ultraviolet to infrared, allowing the camera to capture a series of slightly different images. Back and side lighting help to detect the minute grooves remain where the ink has eaten into the animal hide. Finally, fluorescence reveals the different wavelengths emitted by certain organic materials (i.e. the animal-skin parchment). Ink blocks some of its fluorescence, making it appear visibly darker in photographs. A $4 million (US) renovation of the monastery is also planned to transform one wing of the monastery to storage with advanced environmental controls and a library for study and research needs. Along with other institutions, the St. Catherine Foundation, a British organisation which Prince Charles launched after a visit in 1995, is also raising money. Ultimately, these images will go to a team of 18 scholars with expertise in an array of languages, led by Claudia Rapp, a medieval text specialist from the University of Vienna. Eventually, the images will be available to all scholars around the world through an online database overseen by the monastery. Find out more about this story and about those involved in the project. Read more about other projects using spectral imaging to reveal the hidden text of palimpsests.